The Human c-Myc Cell-based kit is designed for the rapid detection of human c-Myc proto-oncogene in cells. Human c-Myc is a multifunctional transcription factor protein that plays a role in cell cycle progression, apoptosis, and cellular transformation. c-Myc also functions to regulate global chromatin structure by regulating histone acetylation. 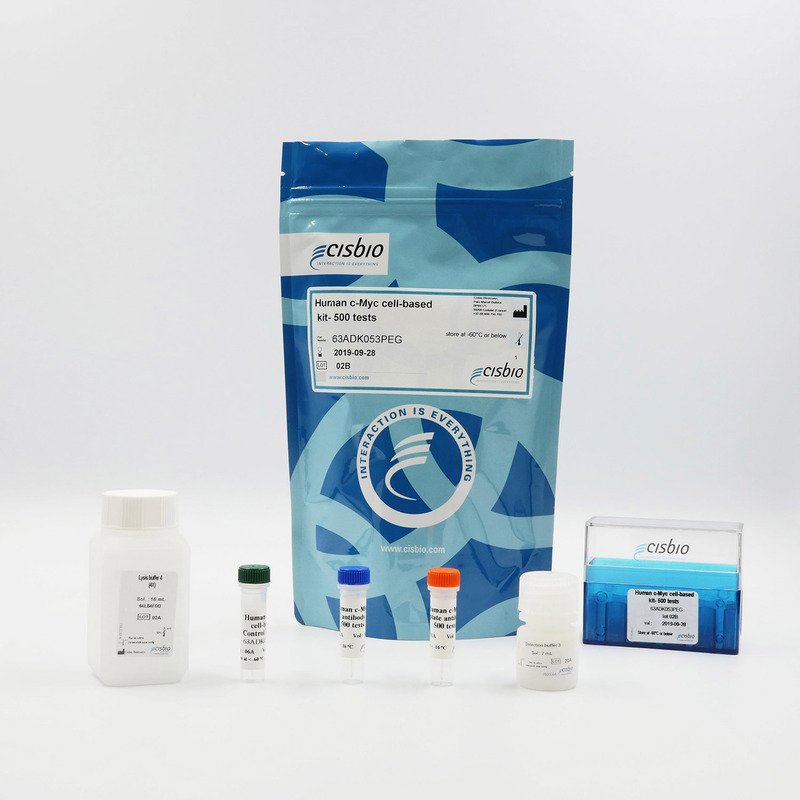 The kit is intended for the specific and fast quantification of c-Myc proto-oncogene in cells. The Human c-Myc is a sandwich immunoassay involving two specific anti-human c-Myc antibodies, respectively labelled with Europium Cryptate (donor) and d2 (acceptor). The intensity of the signal is proportional to the concentration of c-Myc present in the sample. The protocol is optimized for a 384-well plate format, but can easily be further miniaturized or upscaled. Only low sample volumes are needed. The detection reagents may be pre-mixed and added in a single dispensing step for direct detection. No washing is needed at any step. Two-plate assay protocol The human c-Myc assay protocol is described here. Cells are plated, stimulated, and lysed in the same 96-well culture plate. Lysates are then transferred to the assay plate for the detection of human c-Myc by HTRF reagents. This protocol enables the cells' viability and confluence to be monitored. The antibodies labelled with HTRF fluorophores may be pre-mixed and added in a single dispensing step to further streamline the assay procedure. The assay detection can be run in 96- to 384-well plates by simply resizing each addition volume proportionally. HeLa cells were grown in a T175 flask at 37°C - 5% CO2 for 48 h. After medium removal, the cells were lysed with 3 mL of supplemented lysis buffer for 45 min at RT. Serial dilutions of the cell lysate were performed in the supplemented lysis buffer and 10 µL of each dilution were dispensed and analyzed side-by-side by Western-blot and by HTRF. By using HTRF c-Myc only 1,000 cells are sufficient for minimal signal detection while 4,000 cells are needed for a Western Blot signal. The HTRF c-Myc assay is at least 4-fold more sensitive than the Western Blot. 100,000 human MCF7, A549, HeLa, HTC116 and HEK293T cells were plated in 96-well plates in cell culture medium and incubated for 24h at 37°C - 5% CO2. Cell culture medium was then removed and cells were lysed with 50 µL of lysis buffer for 30 min at RT under gentle shaking. 10 µL of lysate was transferred into a 384-well sv white microplate, and 10 µL of the HTRF c-Myc detection reagents were added. The HTRF signal was recorded after an overnight incubation time. 40,000 HeLa cells were plated in 96 well plate in cell culture medium and incubated for 24h at 37°C - 5% CO2. After incubating with increasing concentrations of JQ1 for 24 hours, the medium was removed and cells were lysed with 50 µL of lysis buffer for 45 min at RT under gentle shaking. 10 µL of lysate were transferred into a 384-well sv white microplate and 10 µL of the HTRF c-Myc detection reagents were added. The HTRF signal was recorded after an overnight incubation. 40,000 HeLa cells were plated in 96-well plates in cell culture medium, and incubated for 24h at 37°C - 5% CO2. After incubating with increasing concentrations of TSA for 24 hours, the medium was removed and cells were lysed with 50 µL of lysis buffer for 45 min at RT under gentle shaking. 10 µL of lysate were transferred into a 384-well sv white microplate and 10 µL of the HTRF c-Myc detection reagents were added. The HTRF signal was recorded after an overnight incubation. 10,000 HeLa or A549 cells were plated in 96-well plates in cell culture medium and incubated for 24h at 37°C - 5% CO2. After incubating with increasing concentrations of inhibitors (U0126, Methotrexate and Gemcitabine) for 72 hours, the medium was removed and cells were lysed with 50 µL of lysis buffer for 45 min at RT under gentle shaking. 10 µL of lysate were transferred into a 384-well sv white microplate and 10 µL of the HTRF c-Myc detection reagents were added. The HTRF signal was recorded after an overnight incubation.